Multi-gesture touch screens, now ubiquitous and everyday, offer the means to present control of a very large range of parameters quickly, intuitively and in a compact space. Every aspect of the system is logically organised with a clear and intuitive GUI. Console layout management is quick and easy with a drag and drop interface. GUI layouts re-flow to give selected detail views more visual space with intuitive screen tap control. 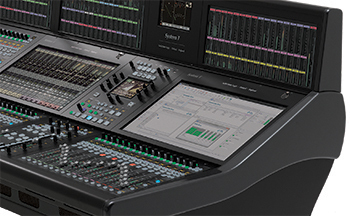 EQ, Dynamics and Processor interfaces feature quick, easy and adaptable drag and pinch control that will be instantly familiar to tablet users. The Channel View provides clear and logically organised overview and interface for detailed channel information. 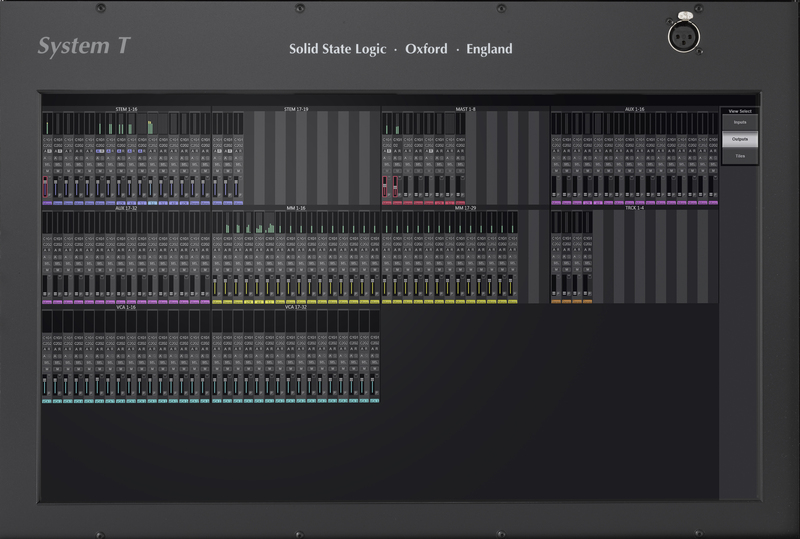 This GUI lines up with the faders in the Fader Tile and provides touch access for all the path functions. SSL Eyeconix displays ensure that channel identification is immediate. 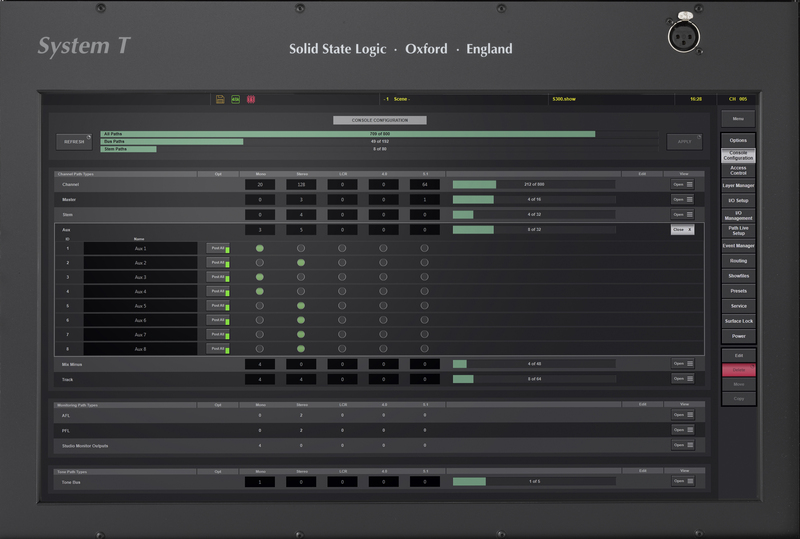 Double tapping individual channels opens up detailed GUI’s for routing assignments, EQ, Dynamics and Panning.Uniquely, System T allows changes in path processing order and bus architecture on the fly through straightforward drag and drop actions. The Quick Encoders in the Fader Tile work in conjunction with selected Channel View functions. In live applications an at-a-glance view of the whole console’s signal flow is essential.The Overview Screen provides this on a touchscreen that enables the operator to immediately access a channel or bus that needs attention. 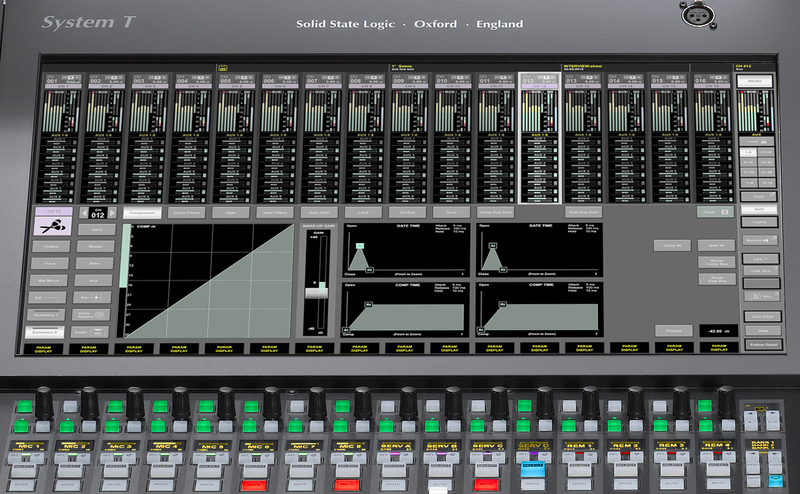 Selection of any channel or bus to the Focus Fader and Channel Tile is literally one press away at all times. With meters and bright red overload indicators for every input and output, identifying such sources is easy and a single press brings the full set of path controls to hand. 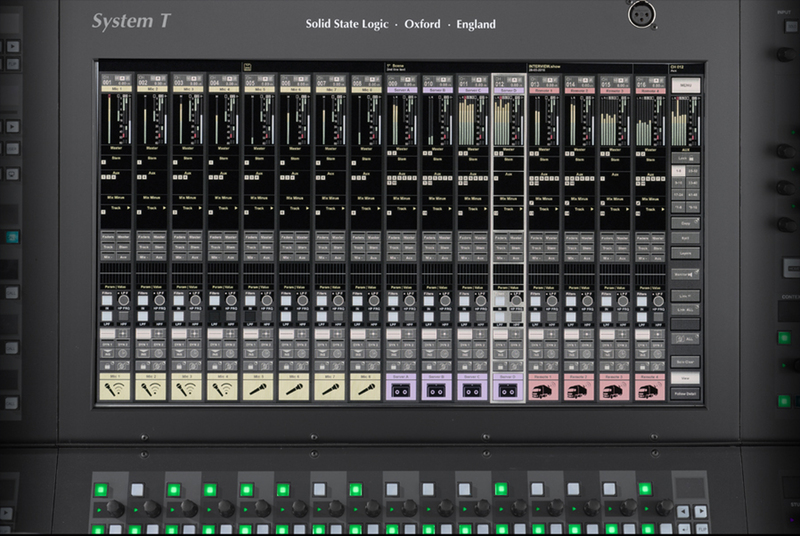 Colour coding enables input channels, mix buses, auxiliaries, mix minuses, main outputs and VCA groups to be readily recognised. System T software includes all setup GUIs directly on the console’s large touch screen. Additional channels or busses can be configured without audio interruption via the Console Configuration page. 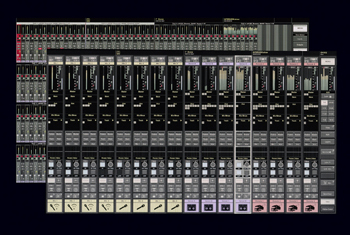 Layer Manager provides intuitive drag and drop assignment of paths to any hardware fader. 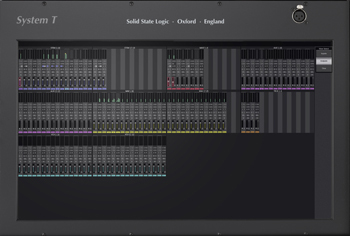 Physical Dante I/O configurations can be organised, managed and easily searched and routed with SSL’s unique I/O tagging and logical device I/O management and routing GUIs. Showfile management, Presets, Event Manager (GPIO and Macro programming), Access control, Scene Automation and other options all benefit from intuitive on screen graphical interfaces. Not only do the the console’s channel view and overview screens intelligently swap locations as you work at different parts of the console, so can other external devices. An inbuilt KVM provides three external video inputs, two of these include USB connectivity to enable touchscreen control. 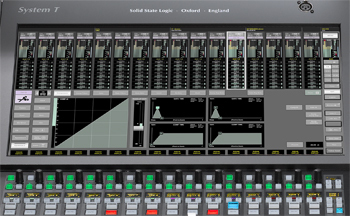 Whether it’s the overall Broadcast control and monitoring system, a digital audio workstation or playout system, the intercom software or even an office computer, any software from any system in a facility can now be viewed and controlled without moving from the mixing console. 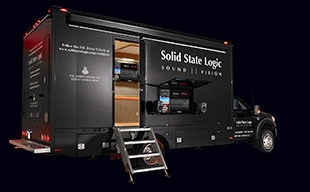 The SOLSA (the SSL On/Offline Setup Application) is an invaluable tool that can be used offline to prepare for productions or online as a remote control application, directly connected or via suitable wi-fi. 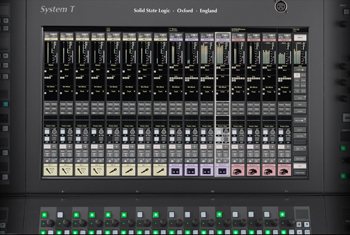 The application mirrors all of the console’s functionality without the audio processing: configurations can be built, input routing assigned and named, buses allocated, effects inserted, VCA and mute group subgroups setup and Eyeconix images allocated. During a production SOLSA can be used running on PC’s with touchscreen interfaces to provide parallel parameter access and independent monitor controls to enable additional operators to manage supplementary tasks. 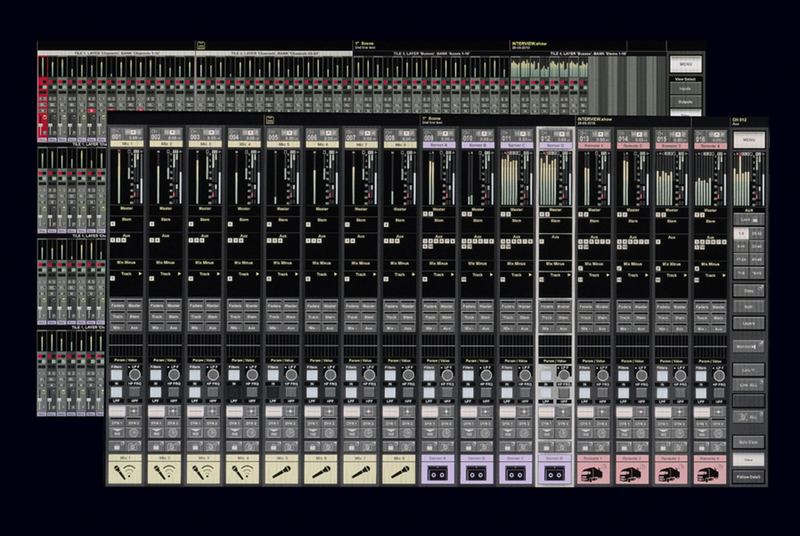 For example, an assistant could prepare and deal with routing whilst the main mixer focuses on the mix, while a third engineer could remix premixes from the main mix to simultaneously generate a local language version or other mix variant. SOLSA also acts as a useful training tool enabling users to get up to speed offline at their convenience.